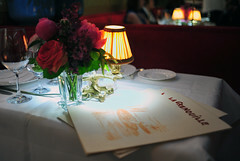 I can imagine Holden Caulfield eating at la Grenouille as an adult, his gawkishly tall frame folded into the tiny back corner banquette – back near the kitchen door. His internal soundtrack would register a complaint about being seated back there, back where no one cares. If he weren’t so yellow, he’d say something to the maitre d’ about it. The servers all despised him anyway, every one of them. You could tell by the way they smiled. What a bunch of phonies, he’d scream on the inside. He’d evesdrop on the table next to him – not intentionally, but only because the tables are so claustrophobically spaced. That would kill him. He’d observe that the electric lamps on the tabletops take up way more space than necessary, and how the chord trails across the table and off one edge. That would kill him too. He’d study and sketch the socialites that filled the room – phonies, every one of them. He’d order a stiff cocktail, or two, with each course. And he’d probably skip dessert altogether. And he’d say he had a lousy time. But we all know that he relished every stinking minute of it. And what’s wrong with overpriced but fairly solid French bistro food? 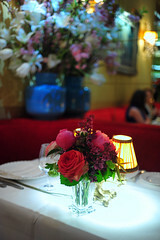 Judging by my dinner there a few weeks ago, that’s what la Grenouille serves. Ms. Toidy-Toid & Toid (a.k.a. Wizard of Roz), Mr. RBI, Houston and I arrived on the later side of the evening and were promptly seated. CLICK HERE to see all of the photos from this meal, or click on the course titles below to see the individual photos. Aux Pistaches, Moutarde à l’Ancienne. Here, the sum is greater than its parts. The food is good, but not amazing. The service is good, but not amazing. The interior is nice, but not amazing. 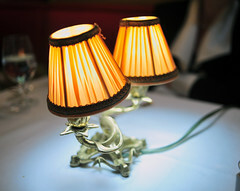 Indeed, there’s nothing amazing about la Grenouille except for what it is as a whole: a well-preserved ritual of a bygone vintage of New York society. And, were people smaller back then? Or could I really have rubbed elbows with Jackie O. sitting at the table next to hers? A meaty pâté, with a ribbon of foie gras and truffles running through it, was one of the best dishes we had (“La Terrine de Campagne“). That pâté came aside a tuft of greens crowned with a quenelle of foie gras. The other one was a whole Dover sole, burnished and beautiful (“La Sole Grillée, Sauce Moutarde“). The fish was presented bone-in on a silver platter. Had there been more space between the tables in the dining room, they probably would have finished the plating table-side. Instead, they removed the fish for filleting and plating at a nearby station. 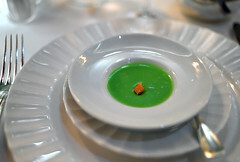 The restaurant’s namesake dish, “Les Cuisses de Grenouilles Provençale,” was also presented table-side on a silver platter. (n.4) Its thick, garlicky aroma hit us like a ton of bricks. The legs – more than a dozen of them – were a little tough, but otherwise flavorful, cooked à la meunière with loads of butter and herbs. The highlight of this dish for me were the spooned mounds of tomato concasse and crushed fingerling potatoes that book-ended the legs and earned the dish its Provençale provenance. Most of our food was good but unremarkable. (n.5) Nothing, save the dense and somewhat dry lobster ravioli, was disappointing (“Les Ravioles de Homard à l’Estragon“). 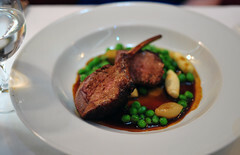 Houston’s lamb was tender, with a deliciously musky body (“Les Côtelettes d’Agneau au Romarin et Petits Pois“). Three gnocchi might have been a bit stingy, but the more attractive half of this dish was the tumble of fresh English peas anyway. Sturdy and sweet, they were truly wonderful. 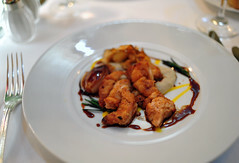 Nuggets of sweetbreads sported a nice, breaded crust, but played second fiddle to a fantastic sunchoke puree (“Les Ris de Veau au Romarin“). Despite the sprigs of rosemary that garnished the plate, there was very little rosemary scent. A steady diet of la Grenouille’s “Rognons de Veau Moutardier Flambé Grande Fine” might actually kill Holden Caulfield. But, as an occasional indulgence, this now-rare classic was quite flavorful. Flambé with cognac, the escalopes of veal kidney were smothered in a creamy mustard sauce and served with side of nutty rice. I mourned over the tough, dry side cuts that seemed to plague the otherwise tender slices from the center of the kidney. Hit and miss, one had to choose one’s bites carefully. We all wanted soufflé. And we were each going to order a medium-sized one until I did a little math. (n.6) I pointed out that we could save quite a bit of money AND see more of the dessert menu if one of us were to order an extra large soufflé and share. Beautifully baked and billowing, our “Grand Marnier Soufflé” arrived table-side, a golden cloud rising from a large casserole. Each of us got a quarter wedge of the soufflé, garnished not with a pool of crème anglaise as I expected, but simply with a dollop of softly whipped cream. The soufflé had a balanced texture and flavor (fluffy, but not too fluffy, eggy, but not too eggy) but was much less boozy than I had hoped. 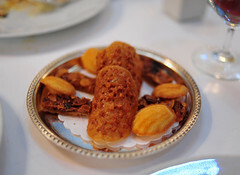 The rest of the desserts at la Grenouille probably don’t get much respect, given that the soufflés see so much traffic. 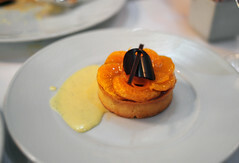 But from “La Voiture d’Entremets” (the “dessert trolley,” which is permanently parked at the front of the dining room, the aisles too narrow to navigate), we managed to pluck a lovely “Tangerine and Chocolate Tart (think milk chocolate pudding in a tart shell topped with tangerine wedges) and a decadent “Butterscotch Eclair” piped with an airy butterscotch mousse. Though excellent, it became cloyingly sweet after a couple of bites. There was also a rich “Chocolate Dome” ringed with raspberry sauce. You’ve probably seen its less-good cousin at the end of a hotel-catered dinner. I ordered the “Tarte au Pomme” because I like tartes aux pommes, and because I like warm desserts that are served à la mode. This one was very good, no better or worse than the soufflé or the chocolate tart, or the eclair for that matter. Like I said, the service here was good, but not amazing. The staff members all look like they could have started at the restaurant when it opened. And like anything that’s been well-aged on one track, they’ve developed loads of character and, if you can appreciate it, a unique brand of charm. Of course, I have no idea if it has or not, but the interior also doesn’t look like it has changed much since the sixties. And by that, I don’t mean to suggest that it’s ugly by any means. I think it’s elegant, even if it has a touch of frump. The dining room is lined with mirrors, ensuring that even the most ill-positioned diner can celeb spot. And, the room is falling over itself with floral arrangements – sprays of cherry blossoms and bouquets of doe-eyed peonies and roses – a signature feature that diners have come to expect. Holden would probably find them lovely. They’d probably remind him of his grandmother, or something. To read about the other restaurants I visited on this trip to New York, CLICK HERE. n.1 Eater recently included la Grenouille in its list of 22 “Old Guard Restaurants to Visit Before It’s Too Late.” It’s interesting to note that la Grenouille is the youngest of the 22 restaurants listed. Opened in 1959, The Four Seasons was the next youngest. Also, given Sam Sifton’s recent 3-star review of la Grenouille, I don’ think it’ll be going anywhere anytime soon, although, I remind myself that I might have said the same thing about Tavern on the Green a couple of years ago. n.3 I would have put my one dinner there at a solid two-star level, not three. 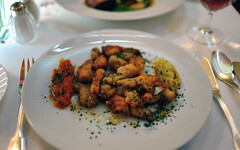 n.4 We ordered the three items on the menu that carried a supplement (excluding the caviar) – the sole, the frogs legs, and the soufflé. All three of these items were presented tableside. I guess you get what you pay for. n.5 I did not want to lessen Ms. Toidy Toid & Toid’s foiefest. Although she was willing to share, I politely declined a bite of our soi disant Foie Gras Queen’s first course, which was offered that night as a special. She loved it. 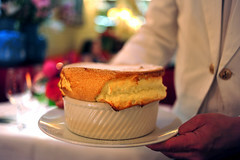 n.6 The soufflé carries a supplement: $7 for small, $10 for medium, and $17 for extra large. Instead of each ordering a medium, one of us ordered one extra-large soufflé to share (there was plenty), leaving the rest to choose something else. Of course, for this to work, everyone has to agree on a soufflé “flavor.” The chocolate and Grand Marnier soufflés are permanent options. The special soufflé the night we dined at la Grenouille was banana-vanilla. ~ by ulterior epicure on May 23, 2010.